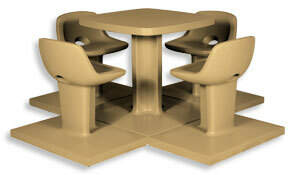 This heavy-duty concrete table set is 3/8" steel rebar reinforced for added strength. The table and seats are cast with their own concrete foundation pad. Encourage the benefits developed from strategic board game play; models are available manufactured with chess/checker game board. Optional corner pavers are available for the 4 seat model. Smooth Finish color options are available as shown. 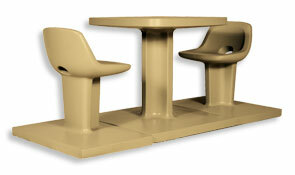 Precast Concrete Table Sets must be placed on a flat stable surface that will not shift or settle such as concrete.